LOCATED ON PHAM VAN DONG STREET – DA NANG CITY near the romantic Han river, modern rotating bridge and the nicest and cleanest beach in Viet Nam. 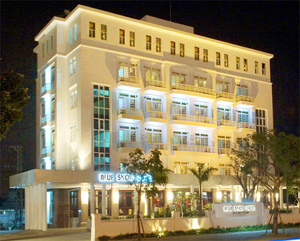 3 star international BLUE SNOW HOTEL consists of 5 storeys, 48 guest rooms, CASABLANCA Café garden and restaurant, MARTIL conference and meeting room, Business Center, Bar and souvenir shop …Just 10 minutes for a drive from Da Nang International Airport and Railway station. up to 300 seats ( Theater ) – 150 seats ( Class room ) with 02 LCD and 01 Screen. Equiped with the LCD projector, modern equipments, bonsai decoration …can demand all the customers’ requirements with many different packages.